The first Jeep pickup since 1992 is coming, and it's a show stopper. These images just prove that the Wrangler conquers all terrains. 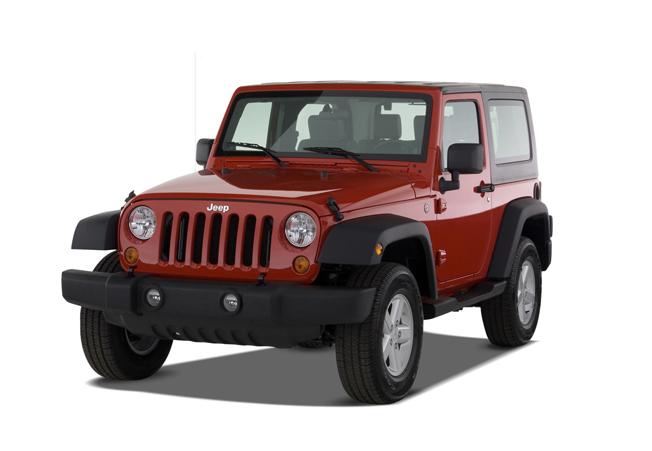 Jeep Wranglers can be a pretty penny to get and are highly sought after vehicles. Jeeps aren't just popular with off-road aficionado's; they're also the vehicle of choice for a number of famous people. When you think of famous movie vehicles, you can't help but think of Jeep. Here are 5 of the most prominent roles that Jeep has played in movies. Jeep has a rich and interesting history serving our military. Heading out to tackle some trails in your Jeep? Here are the top 5 tips for off-roading in your Wrangler. Do you want to spread some holiday cheer every time you drive around? Add some lights to your Jeep. Here are the Jeeps that put a smile on our faces during the holidays. Feel the freedom with no doors on your Jeep Wrangler. Preparation starts beforehand, so always do a maintenance check of your Jeep before heading into the winter weather. There have been rumors of a new Wrangler pickup truck coming with the next generation, but then there are always rumors of a new Jeep pickup. Let's look back on some of the trucks that make people wish for another one. Taking your Jeep Wrangler camping will allow you to create various memories and adventures. Here are some gear to make your trip much better. If you have a Jeep Wrangler, you modify it; that's just the way it works. Off-roading is an extreme activity, here's what you need to take with you to ensure your trip is fun and successful. The Jeep Wrangler is a fun and durable SUV, and treated right it can get you to the ends of the Earth and more importantly, get you back. That being said, here are some things you ought to avoid doing with it. Jeep has always been a legendary brand; take a look at some of the lesser known vehicles that made it legendary throughout the years. Did you even know any of these Jeeps existed? Forum members recommend it, so why not give them a consideration? If you want to make the best out of your Wrangler, here are seven packages and features that you shouldn't pass on. The square shouldered Jeep Wrangler may have the perfect shape for recreating in Lego form. These models we found look so good you want to hop, ride off and make everything awesome in one. The Jeep Wrangler makes Halo headlights look good. Here are the reasons to make your Jeep Wrangler a force to be reckoned with out on the nightly road. A mall crawling Wrangler is a Jeep that looks like a beast, but isn't used to do beast stuff. There isn't a person on the planet that doesn't know a Jeep when they see one. But these might be the most iconic of the bunch. Have big Jeeping dreams, but not much cash to spend? These 5 used Jeep models can help fulfill your off road dreams on basic budget. Fifty years later, the Easter Jeep Safari continues to gain popularity. Check out these awesome Jeeps modified for it. Owning a Wrangler means tons of fun awaits you. Here are some of the types of adventures you can have off-roading. The 2017 Wrangler Rubicon Recon is a special edition that will make you want to make a big purchase right now. If you're a fan of the legendary Jeep Wrangler, then you will love how they advertise it. Jeep has built so many awesome concept vehicles over the years that it's hard to narrow them down. But these might just be the six coolest. The next-gen 2018 Wrangler won't see any dramatic changes, but will be tweaked with new LED lighting, a more aerodynamic body, and possibly some new top choices. Check out more of what's in store. If you are a fan of pickup trucks, but you just love the Jeep Wrangler, you will be extremely happy about this. You've got your green shirt, green beer, and green wig. Now all you need are these seven green Jeeps. The Jeep Wrangler is nothing short of an off-roading legend but has never been known to perform well on the roads. Here are some modifications that will make it more road-friendly. Take a trip back to a different era with these awesome vintage Jeep ads. You may have never heard of a Jeepney, but everyone knows exactly what they are in the Philippines. Here the history of this very popular Jeep based public transportation system. Think you know everything there is to know about Jeep? Here are a few little-known facts you might not be aware of. If you have a Jeep Wrangler, then don't sell it until you off-road one or more of these off-road trails. One of every Jeep enthusiast's favorite thing is to see some of the new Jeep concepts. Check this Jeep Easter egg basket that is filled with mind-blowing Jeeps. The New Detroit born and bred Trackhawk SUV will blow your mind via the surprise it has under the hood. Check out what the new Grand Cherokee has in store for you. The Jeep has been around for a long long time. In appreciation of this, Jeep has seen fit to sprinkle little nods to the past throughout their vehicles for eagle-eyed owners to spot. It's that time of the year to enjoy everything that comes with the warmth of Spring. Get in here and check out these Easter eggs colored Jeeps. What are the best reasons for using a long arm over a short one? Read about the pros and cons here before making your purchasing decision. Jeep has introduced its new crossover concept, “Yuntu.” Here are a few images of the company’s bold, new vehicle. The Jeep is one of the handiest American vehicle brands around. Why not surprise your mother with one this coming Mother's Day? Our members have some of the sweetest Jeeps around. Here's proof. Looking to improve how you rock and roll when it comes to the rock crawl? Check out these 4 tips that will help you clear any obstacle you come across. Hi, and welcome to the wonderful world of Wranglers. To see what you need to know before you go out off-roading, just check out our guide. If you're in the market for a new Jeep, check out these awesome finds from the JK classifieds. The Bantam Jeep Festival is right around the corner the corner and should be on your list of places to check out is you love fun, automotive history, and Jeeps. Have you tackled Colorado's Alpine Loop yet? If not, you're probably going to want to make some travel plans for you and your Jeep. So far, the Jeep brand has been nothing short of a legend. Here are a few that helped the brand build its legacy. Measuring more than 25,000 square miles, the Mojave Desert occupies parts of California, Nevada, Arizona, and Utah; the vast majority of it unpaved and nearly empty. It is a great place to have some off-the-road fun. There is off-roading, then there is off-roading through millions of years worth of geological history. The Grand Canyon is simply one-of-a-kind. Are You Brave Enough for the Dalton Highway? There are numerous wilderness areas that offer great off-road challenges, but Death Valley is one of the hottest places in the world. Do you think you can handle it? Independence Day is around the corner, and what better way to celebrate it than doing Jeep stuff, with our Jeeps, around other Jeep owners. Off-roading the Munro Trail in Lanai, Hawaii is the definition of living the dream, if you're known to dream big. With the right modifications and know-how, a Jeep can excel at just about anything. Here's the story of how a solid axle Jeep took on Miatas, Camaros, Mustangs, and BMWs on the race track. The Super Yeti might be the fastest, best handling Wrangler on the planet, at least on a twisty paved road. This Comanche Renegade might not be the Wrangler pickup, but it sure as hell looks good to us. Check out this crazy conversion inside. The name Gladiator holds a lot of weight in the Roman history, but it also holds some serious weight for the true Jeep enthusiasts. Join us on a journey down memory lane with the legendary Jeep Gladiator. Jeeps and sand go together like pineapple and coconut, so here's a great excuse to book another summer vacation. Hop in your Jeep and head to the annual Jeep Beach event in Florida. Don Foran recently parted with a Jeep that was near and dear to his heart so that others could enjoy it. Hear all about what Dan and a special Jeep went through together during World War II. Cage Match: Durango SRT vs Grand Cherokee SRT! Battle of the behemoths! Which one of these supersonic SUV's can best cure your need for SUV speed? The JK doesn't have too many areas of opportunity, but this big bore steering gear kit addresses one of them. The Jeep's greatest successes were not achieved in the civilian market. See what they cooked up for the government and military sectors. Did you know that in 1977 NASA conducted a study on a “State of the Art” electric postal jeep vehicle? Its findings are truly interesting. You've never seen a Jeep Wrangler quite like this one. Check out this modified off-roader from the future right here. The next big Jeep is just around the corner. See what you need to know about the new Wrangler model right here. Is there a greener side to the Wrangler than we thought? Check it all out inside. Love calls for adventure. Adventure calls for Jeep. Jeep owners understand the meaning of off-roading. When your vehicle is equipped to do everything the Jeep can do, you have to be prepared for anything. You want to look good doing it, too! Is the Jeep Grand Cherokee Trackhawk the World's Strongest SUV? The Trackhawk is here, and it could push the boundaries of what you expect from SUVs. Check it out inside. Can the Jeep and the environment finally get along? Will petrol powered Jeeps be a thing of the past? Find out about these cleaner offroad vehicles inside. The Jeep is perfect for off-road adventures, but taking one racing involves a lot of preparation. Check out this list of mods inside. The all-new 2018 Jeep Wrangler comes fully equipped with a bevy of promises, including improved conveniences, fuel economy, and safety. Who says a Jeep can't be practical? It can. Let us show you. This military-themed hot rod jeep is packed with details... and a V-8 (not an LS!). Check it out inside. Meet the world's first full EV off-road truck. Check out the electric Bollinger B1 inside. The new JL Jeep Wrangler is a fresh redesign of our favorite off-road vehicle, yet retains some of the best features of the outgoing JK model. Spy shots of vehicles come and go with changes being implemented from the concept phase to production. Let's take a look back the soft-top Rubicon and see the development. The Cherokee was already a solid offering, but Jeep decided to make it even better! Check out this nearly brand-new Renegade. American POWER vs. Italian Finesse...which will emerge victorious? Find out inside. Although the new JL Jeep Wrangler models are just hitting the streets, turn-key V8 conversions are soon to be available to give owners all the power they'd ever need. Everybody loves the Jeep Cherokee XJ, but why? We've rounded up all the reasons the XJ has become a true legend in the automotive world. The refurbished Renegade has returned! Close to two dozen aftermarket companies donated equipment to the high school students for this project – check out the final design. Jeep Wranglers are very versatile vehicles. Check out how they are used in Italy. Check out what Crown Automotive did to this rare Jeep wagon from 1963. Check out this 1945 Willys Jeep MB that once belonged to the King of Cool, Steve McQueen. These Jeeps are out there taking advantage of winter. Are you? One of the first civilian Jeeps has been restored to its former glory. Someone bought this Postal Jeep with two small block Chevy engines bolted to the frame. It may still be winter, but Jeep Fest will be returning to Toledo this summer welcoming attendees from all across the world. Jeep has always been a legendary brand; take a look at some of the lesser-known vehicles that made it legendary throughout the years. Will Jeep-sharing be the next big thing? Jeep that was released after WWII was recently updated with a wide array of new parts to further extend its life. Check out the results of this six-part competition series. Long-forgotten Jeep Treo concept might just have a place in today's world. Don't judge Jeep Wrangler's new eTorque mild-hybrid assist tech before you read this. The industrious man behind the vehicle that has captured the hearts of people the world over. Ever wonder what a modern day Willys and Jeep mashup might look like? Wonder no more.